Note: The following is the platform of the workers engaged in the occupation of the ERT television and radio studios in Thessaloniki, Greece. The workers of this public broadcasting institution occupied the facility in June 2013 after the previous government shut down all of the public radio and television facilities in Greece. They have maintained the occupation ever since and have continued broadcasting 24 hours a day in defiance of the government. The new Syriza government, in one of their first official acts, reopened ERT. The workers, however, do not want to return to the old system of bosses appointed by politicians telling them what to do. They are pressing to run the broadcast facility as a worker managed cooperative. 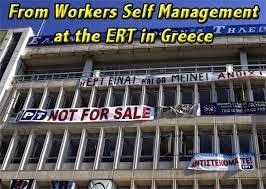 The statement from the ERT workers is published below. On the occasion of the first anniversary since the government shut down the country’s public broadcaster Hellenic Broadcasting Corporation (ERT) in a coup-like move on the night of June 11, 2013, we the workers of the Self-managed ERT3 who have persevered with our independent struggle to keep ERT3 open for over a year now in order to serve the people by providing regular and independent programming, we the workers who are convinced of our rights and the oncoming vindication, are preparing for the “day after” and are hereby presenting our text/proposal for “The ERT We Want”. The following text has emanated through direct-democracy procedures, namely through the numerous general assemblies organized by the struggling workers of ERT3 in Thessaloniki. Written word by word by a nine-member working group which was voluntarily selected through our assembly, the proposal was returned to the general assembly for approval before it took its final form. The proposed text outlines the key principles and aims, the means of financing, the sector of labor relations, the public’s participation and the model of «administration» during ERT’s new period of operation. It is dedicated to the hundreds of thousands of people who stood by us in solidarity during all these troubled months, as well as to all the Greeks and other peoples who have been profoundly affected by the brutal pro-memorandum government policy of recent years. Yet, it is particularly dedicated to those who refuse to bow their head and choose to carry on with dignity and unceasing efforts until the final victory for freedom and real democracy, instead of yielding in the face of a black regime. We the workers of Free Self-managed ERT3 are publicizing this document today, calling on all of our struggling colleagues throughout the country, on our brothers and sisters in Athens, in other large cities and in the proud regional stations to embrace our effort so that we may all together press ahead with dignity. We call upon the general public to support the Public Broadcaster we dream of; this dream is society’s offspring, society gave birth to this dream. We the workers of Free Self-managed ERT3 declare: VICTORY IS NEAR, NOT BECAUSE VICTORY AWAITS US, BUT BECAUSE WE ARE MOVING TOWARDS VICTORY. Independent information and quality-driven cultural/entertainment programming provided by a truly PUBLIC and DEMOCRATIC broadcasting organization constitutes a public good, not a commodity. Freedom of press, uncensored journalistic work, absence of “orders” from superiors, cultural creativity and promotion and the unimpeded conduct of investigative journalism for the good of the general public, especially for the weaker social groups and movements, all constitute a uniform and non-negotiable right and obligation. The voice of ERT must be transmitted everywhere in Greece and anywhere Greeks reside in the world. The state has a duty to provide the appropriate and necessary infrastructure to fulfill this purpose. Respect for human rights, both individual and social, is to be enforced by all workers without exception, for the citizens of the country and the world. ERT’s role is partly educational; it is to provide quality cultural material, offer an outlet of expression for the isolated social groups, as well as care for the advancement of the creative imagination of the younger age groups by encouraging interactive skills and critical thinking. ERT ensures in practice the protection of human dignity, while it highlights, denounces and rejects all expressions of racism, bigotry, sexism, nationalism, state authoritarianism or any form of discrimination against individuals or groups targeted for their political / social / trade union action. The ERT has been serving the community and its needs, while simultaneously an embankment to the phenomena of "social automation-hash-cannibalism", whenever the power of any attempts to cultivate the society based on the premise of "divide and rule". ERT controls the power and not the same as it is neither a government body and its mechanisms, or institution of parties and organized individual or business «circles». The general assemblies of workers and the active working folk remain vigilant in observing these principles and aims at all stages of ERT’s operation, in order to prevent any attempts at interference, may that be via censorship or other, regardless of which institution this attempt may stem from. FUNDING The licensing fee is ERT’s main source of funding; it is not to be utilized for any purpose unrelated to the public broadcaster’s needs and does not constitute in any way a funding opportunity for the given government (i.e. transferring a portion of the licensing fee to state investments in photovoltaics). The compensation rate is determined in accordance to income / social criteria. Those living below the poverty line are exempted from paying the licensing fee. ERT operates under a special economic state, i.e. a public utility that cannot be transferred or sold to private entities. ERT ceases to be a corporation. ERT, as a public broadcaster that actively exercises its role in providing quality information, producing programs that serve as public goods and not commodities, will not become involved in the advertisement genre. The additional financial needs that will arise, may they be for larger-scale productions or for the broadcast of breaking news shall be covered by the state. Excluded from the no-advertisement clause will be the ERT channel assigned to broadcast an event that is accompanied by sponsorships. All of ERT employees will be hired under an open-ended work agreement, with full-time and exclusive employment and insurance rights, without exception. There will be no differentiation between regular and temporary staff. All (de)regulatory rules (articles and clauses on contracts or staff regulations) that perpetuate the status of short-term contracted employees and instead conceal fixed and permanent needs in the operation of ERT will become null and void. "Outsourced program collaborators”, "special advisers" and "Special Staff Positions" have no place in the new operation of ERT. There will be no employees transferred from subcontracting companies. Members of staff with specialized subject work (cleaning crews, security, cameramen, etc.) constitute an integral part of ERT’s human resources and they are individuals hired specifically for the said task, holding the same rights as all other workers. Any significant new need that may arise to cover "gaps" in programming shall be met either through the existing specialized staff and, if this is not feasible, then it shall be covered by staff that will be hired at ERT with exactly the same employment terms that apply to the other workers. The actual emergencies for external 'seasonal' collaborator or employees with reduced working hours will be reviewed as special cases by the instituted bodies of program production, which will undertake to submit detailed proposals to the body of the General Assembly, which will make the final decisions after assessing all the facts of each case separately. ERT, as a broadscaster with a truly public service character, is behooved to pay close attention to the voice of the very society it addresses. To fulfill this objective, ERT will provide the conditions that enable a participatory formation of the overall philosophy of the transmitted program. In order to avoid overriding the will of the people and the arbitrary representation of social groups of "factors" and vested interests of the political, social, economic, self-governing powers, the citizens’ society shall have first say in the subsidiary influencing of the overall program philosophy, through its the solidarity structures, social movements, collectives, or individuals who are experiencing racism and repression, neighborhood committees, direct democracy grassroots initiatives and the assemblies of the unions representing the struggling sectors of Greek society. Representatives of these aforementioned living cells of society will undertake to convey the decisions of their general assemblies or the views that are shaped as a general sense of society and, in conjunction with the proposals that will be submitted to ERT (the program committees and ERT staff assemblies) by representatives of various scientific meetings / training / professional sectors, a largely unmediated hearing will have been achieved. This ensures ERT’s truly public nature, which is not merely addressing the public, but is mainly initiated by the people themselves. Two of the main characteristics of the months-long struggle maintained by the workers ERT against the government-enforced "black screen", the self-management of the produced programming and the self-administration of the struggle, are incorporated as non-negotiable conquests in the new operation of ERT. The overall philosophy of "administration" is based on direct democratic procedures, the rotation of the various departments supervisors and their direct recall, where the main decision-making body, that is the general assembly of workers, so decides. The classic notion of directorship or the position of department "supervisor" acquires characteristics that have to do with the ability to exercise a coordinating role in order to improve internal operations and achieve a better result in the transmitted program. The so-called 'managerial prerogative' is abolished and is replaced by the principle of respect among equals. The department coordinators (supervisors) shall be elected by the employees of the department. They are accountable, reviewed and may be recalled by the General Assembly of the workers. The same stands for the individual administrations. Similarly, the general coordinator (the classic position of general manager) is excluded from the above outline. The election of the general coordinator is made by the general assembly of the employees of ERT. In all, the position of the general coordinator / manager does not hold the power and imposition of a blanket authoritarian management / operation of ERT, but, instead aims to coordinate the departments in order to achieve the best quality results for the benefit of society and the potential for enlargement of the rights and the defense of the gains of the people, including the right to free and independent information and quality entertainment. ERT, regardless where it broadcasts from, constitutes a unified, public broadcasting organization, while, concurrently, each and every channel, radio or digital media of ERT (among them ERT3) maintains its administrative autonomy. ERT has the necessary human resources and the appropriate broadcasting infrastructure in every county of Greece, in order to assure that any local or breaking news in the given regions is covered on the spot. Solidarity, mutual understanding, respect for autonomy and coordination among the members of this public broadcaster constitute prerequisites not only for the implementation and consolidation of internal direct democracy procedures, but also for the prevention of a centrally-controlled administration. Nationwide meetings of coordinators and committees of all broadcasting units in the country will be held at regular intervals, conveying the decisions of the general meetings of workers and civil society in order to exchange views, to address weaknesses and to continuously improve the broadcast program.